The Tustin city council had its latest closed-door meeting about building a stadium for the Los Angeles Angels last night, and … it was behind closed doors, so we don’t actually know what they talked about. In Anaheim, an appraiser valued the land in question at $225 million. Parker said the Tustin land could be worth a similar amount and said the city would expect to make back that amount on any land provided to the Angels, most likely from lease payments or a share of development profits. That’s pretty huge: Parker is saying that not only would Angels owner Arte Moreno have to pay for his own stadium costs, but he’d have to reimburse Tustin for the value of the land it would be giving up. Since that’s pretty much the same deal that Anaheim Mayor Tom Tait is asking for — and which Moreno dismissed as “going backwards” — this bidding war isn’t going at all how the Angels owner must have wanted it to. This is actually a pretty remarkable moment: Two local elected officials demanding that their cities actually get something significant in return for helping out with a stadium, instead of the usual reaction of asking when to jump and how high. It’s too soon to tell if this will start a trend, or will even hold up — the traditional response from team owners is to wait until somebody more amenable to their demands is elected to public office — but it’s sure fun to watch while it lasts. This entry was posted in Los Angeles Angels of Anaheim by Neil deMause. Bookmark the permalink. I think in California this will become a reality. One of the biggest tools that cities had to build stadiums (redevelopment) went away in 2012. Petco in SD and the new 49ers stadium were redevelopment projects. Cities in CA now will look for long term benefit, like Tustin and Anaheim (at least Mayor Tait) are doing. Neil praising Orange County. 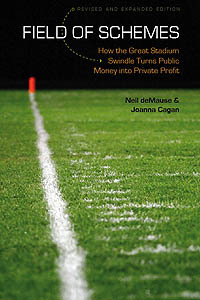 All things are possible through stadium subsidy activism. I’ve said many times before, stadium subsidies (or even local-level corporate subsidies in general) are not a Republican/Democratic thing. It’s why you often see very strange bedfellows in coalitions fighting against them. For the record, you could end up seeing the Angels fleeing the Los Angeles area. It depends on what could happen, but this could be a chance to see New York City become a three team city once again. The Angels currently have shared territorial rights to the second largest metro area in the nation. To get into the NYC area, they’d need to kidnap a couple of Steinbrenners and Wilpons. That scenario is pretty much inconceivable. The Los Angeles Angels of Hoboken does have a certain charm to it. Assuming Arte has done some market research he probably knows that the Angels have a unique draw from the inland empire. The focus on Tustin makes me think that’s a market he’s concerned about retaining. It’s about the same drive for those people (although local traffic may tip the balance in favor of Anaheim). As a displaced Angels fan, I’m watching with keen interest. Watch Arte come to his senses in the end and simply sink some of that “new stadium” money into his perfectly serviceable current stadium. And I agree with citizen714. This is the beginning of the end of these stadium subsidies, at least in California. There’s no more public money for these things without actual public approval. Santa Clara was the last stadium to get in under the wire before redevelopment died. The Earthquakes new stadium will be the first of the new breed of private stadia with them being only miles apart ironically enough. Yeah, this seems like a “California” thing in many ways. As noted above, the elimination of the RDA funding mechanism (at least, I think it’s been eliminated…) made stadium welfare much harder for billionaires to sink their proboscis into. It would be great if the “how will our city’s finances be protected” mantra caught on across the continent, but I don’t know that it will do so. I can’t imagine a situation under which the Angels abandon the LA Basin for another locale (no matter how much somebody else offers). The market for their local/regional TV rights alone could dwarf total revenues available in most other available markets… something that isn’t an issue for the NFL obviously. I am also a displaced Angels fan and Orange County native, and my concern is that forcing Moreno to build a truly privately financed ballpark without any public subsidy or land giveaway will compel him to move the team back to Los Angeles. A new ballpark in Los Angeles would carry fewer long-term risks (and higher potential rewards) than a new ballpark in Orange County. Revenues in Los Angeles would be higher due to bigger naming-rights, advertising revenue, and broadcasting rights revenue. And, lest we forget, Los Angeles County has 10 million people; Orange County has 3 million people. John: The thing is, though, this already was a plan whereby the Angels were having to deal with no stadium cash — the death of RDAs is almost certainly why the Anaheim council offered free land instead. Both Anaheim and Tustin are now saying, “We’re not even going to use end runs around the budget to give you subsidies,” which is extremely unusual. Neil: If placed in the right spot (near the Metro Red/Purple Line and/or existing parking structures), a new ballpark would require less land in LA than in OC. For PR reasons, the Dodgers are unable to sell naming rights at Dodger Stadium, which could generate up to $20 million per year. Yeah, I’m unconvinced. If L.A. is such a gold mine, why are the Angels even messing around with Tustin? Neil: To say he did his due diligence. In a best case scenario for Moreno, he gets free land in Tustin; but if Tustin is offering the same deal as Anaheim, it does not pencil out. Also, there’s no way on earth a baseball stadium in L.A. would get $20 million a year. The only stadium that’s reached that threshold is the Cowboys’, and people actually watch NFL games on TV. I’m not saying an L.A. stadium is impossible, mind you. Just that the financing would be equally as difficult as an Orange County stadium, unless somebody gives him a pile of free land to develop as part of the deal. It’s not that far-fetched. Farmers offered $700 million – $1 billion for 30 years of naming rights at Farmers Field. Citi is paying $20 million per year for naming rights at Citi Field. A compelling new ballpark in Los Angeles could command a $20 million/year naming rights fee. Maybe the Angels and Dodgers can share a new stadium in LA county. Or the Angels can play 20 home games a year in LA, and call it BP Field or whatever for the week. The Dodgers and Angels can share the naming rights.